This is obj of loose Michael 4 bodysuit in Poser scale. This QuickSuit is made with purpose to serve as a base for creation of M4 conforming and Poser Dynamic clothes. M4 QuickSuit is royalty-free - so you don't need to credit me, ask me or pay me anything. 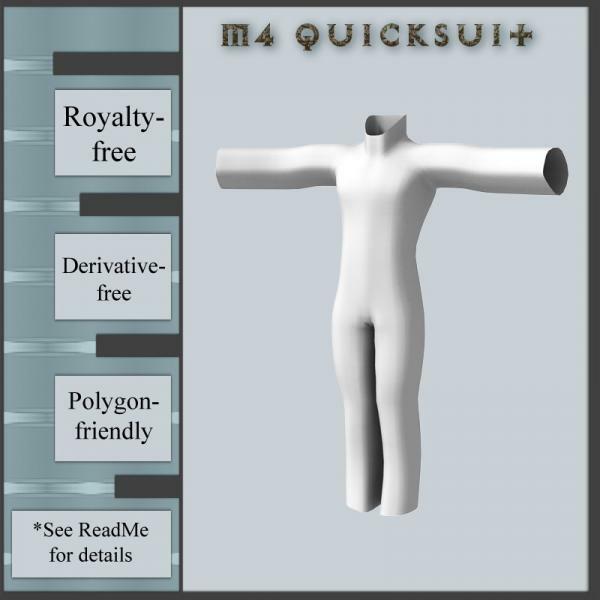 M4 QuickSuit is derivative-free for purpose of making both commercial and non-commercial conforming and Poser-dynamic clothes for M4 and M4 only. But to do so you must change (add, delete, modify) at least about 30% of the base obj and simple smoothing/SubD of QuickSuit doesn't count as modification. You can use this QuickSuit in other applications other then Poser and DS as long as the final product is made for Michael 4 and it is respecting terms of usage. You can set you own licence for your derivation but you hold no power over the base obj of M4 QuickSuit. You can't redistribute that base pack without abovementioned changes for sell or for free, as part or as whole in any way. Due to changes in Second Life EULA as on October 2013, the use of this content in Second Life in any shape of form is especially prohibited. I keep all appropriate rights as a creator of the item. Please, read the ReadMe for details and clarifications. Rheanna (8 years ago) Inappropriate? jartz (9 years ago) Inappropriate? Thank you so much for this, as it is very hard to find M4 made clothing. I'm so glad you made this. Have a nice holiday. Stasia (10 years ago) Inappropriate? maurin (10 years ago) Inappropriate? Axe Swipe (10 years ago) Inappropriate? RAMWolff - RAMWorks (11 years ago) Inappropriate? manikus (11 years ago) Inappropriate? Houri Durga (11 years ago) Inappropriate? Thank You so much Kattey!